Rooms situated above the river. Kitchenettes in rooms. Picnic areas throughout grounds. Perk: Pets welcome. Durgan Flat: (800) 696-3308 121 River St Downieville, Ca 95936 off of Hwy 49. Cottages on the Yuba River. Wine and Cheese, continental breakfast brought to your room…just a few sophisticated extras that will make your stay special. Perk: Prep area for guests to get heir gear together for whitewater trips. Carriage House Inn: (800) 269-2289 110 Commercial St, Downieville, Ca 95936 off Hwy 49. Eight rooms to choose from with that overlook the Downie River. Free Wi-Fi. Downieville is home to the Downieville Downhill Mountain Bike race, a very fun event that takes place in June. Make sure if you go the weekend of the race, that you book lodging in advance! 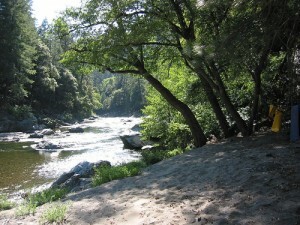 Union Flat Campground: Located 5.9 miles north of Downieville on Hwy 49 Sierra City, CA 96125. (530) 587-9281 Advance reservations are required. No hook-ups, no showers, and bear bins are needed.